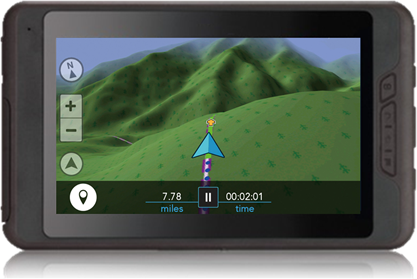 For starters the eXplorist TRX7 is a ruggedized Android tablet, integrated with a sturdy RAM suction-cup mount, and Magellan's proprietary TRX software. It's large, bright 7-inch screen make it easy to read, even when you're bouncing up and down. The ORV model comes with a suction cup mount, that adhered perfectly to a flat spot on my dashboard. The PowerSports version includes a RAM rail mount. The tablet clips in to the mount -- also with a very solid connection -- and charges through a microUSB port. The TRX software comes pre-loaded with an amazingly-detailed topographic base map of the United States (including a 10M 3D view, and even more detailed 2D view). Especially out here in California, where some fairly large areas of the state don't have cell phone data coverage, having an always-available map is a huge benefit. The topo map has roads (and especially trails), but doesn't support turn-by-turn navigation, so it isn't going to completely replace Google Maps for your on-street driving. Where the TRX begins to shine is when you get off the road grid. 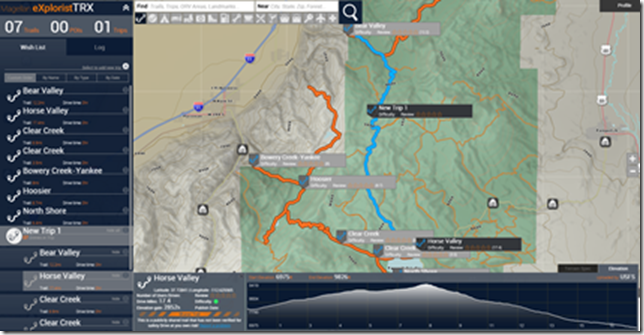 It has around 44,000 OHV (Off Highway Vehicle) routes pre-loaded along with the base map (especially those in National Forests). In addition, trails and routes can be crowd sourced by the TRX user community. So I expected the TRX7 to be awesome for off-roading. But I got another pleasant surprise. The topo map also contains all the small roads and back roads that haven't made it into typical street-centric navigation software. Even when those roads make it into street navigation software, they aren't very detailed. In addition, if you're off-grid when you need detail on backgrounds, you're out of luck without a pre-loaded basemap. For example, when I took the unit into Pinnacles National Park, Google Maps only showed me a big green blob, with no streets or detail. The TRX7 had every nuance of every road and trail. In fairness, if I'd pre-loaded the area from Google Maps before I got there, I would have gotten quite a bit more information than a green blob, but not nearly as much as with the TRX software -- and TRX also provides all the topographic information which is very helpful for route planning and to get a sense of the surrounding area. The TRX7 has a fairly powerful search capability, for identifying points of interest or trails that meet your specs. than a smartphone with a more conventional cloud-based mapping application. Similarly, you won’t have much luck finding most street names, either. So you’ll definitely want to consider having a more-traditional mapping application if you need to do some on-road routing to get to your off-road adventure. I didn’t have any luck trying to sideload Google Maps to have as an option, but I’ve asked Magellan to let me know if that should be possible. 2nd UPDATE: I had been told (and passed along) that street-level navigation would be added later this year, but the company has now said they aren't ready to discuss future directions in that area. 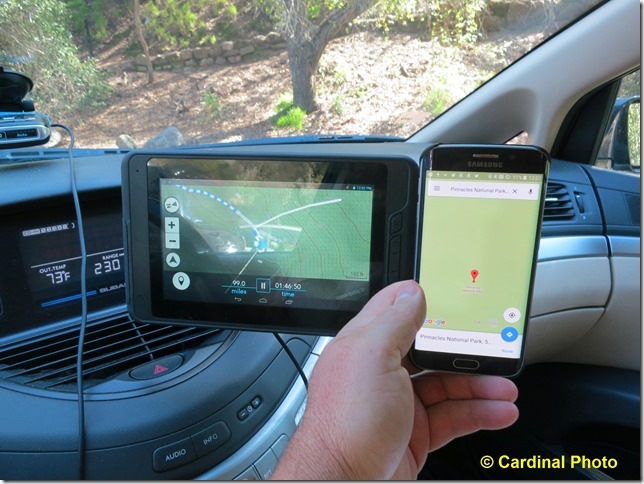 FWIW, if there isn't a supported solution, allowing the side-loading of either Google Maps or Magellan's own excellent CoPilot would be a great additional to the device's functionality, IMO. The TRX7 has good support for listening to your tunes while you travel. It has some free memory available, but more importantly it has a microSD slot for expansion. On the audio side, it has a reasonable pair of speakers in the back, plus a headphone jack and Bluetooth support. The standard Android Music app is pre-loaded. The microSD card can also be used for loading photos onto the device (for further sharing or posting along with your tracks, or just showing off to friends). The TRX7 has an easy to use journaling capability. Saving a track is as easy as a single click, although you can also add metadata about its difficulty and other attributes. Sharing tracks is almost as easy. For starters, they are automatically synced with your own account, so you can share between your desktop, mobile devices, and TRX7. But you can also add photos and share the tracks and photos with your favorite social network (Facebook and Twitter are currently supported), or the TRX community. If your device is connected while you’re traveling, you can post updates by simply clicking the TRX hashtag button. You can keep not just routes you’ve followed in your Journal, but also a Wish List of routes you’ve found or created that you want to remember for future trips. One nice feature of the track logging is that you can specify your vehicle – especially helpful so others who might want to follow your route will get a sense of whether it is drivable for them. You can also have multiple vehicles for a single account. Much of the long-term strength of the TRX7 and Magellan’s TRX software is likely to be in its community. Like Strava (SP?) 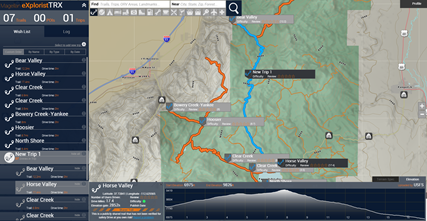 does for cyclists, TRX lets you save and share your journeys, along with a variety of metadata on the terrain, whether 4WD (or 4WDLo, etc.) are required to traverse it. I was particularly excited about this feature, as there are some dirt roads in the Mojave Desert that I've been nervous about trying without recent scouting reports. Unfortunately, the TRX community is still fairly new, and I had trouble finding trip reports that would help me. I'm sure that will change over time. 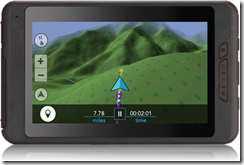 Notably, and fortunately for the community, you don't need a dedicated GPS like the TRX7 to contribute. Users of Magellan's free TRX mobile app can also contribute (and can sync their own trips and trails with their Magellan devices). If you can't find a pre-recorded trail you want to follow, you can create your own route and upload it (in the form of a GPX file) to your TRX account (using your desktop computer). I tried it out, and got a perfectly usable trip map that I could tell the TRX7 to follow. In follow mode, you have your choice of either a traditional "2D" overhead view, or a "3D" view from the perspective of the driver. Both were bright and usable, in my experience. The TRX7 doesn’t come cheap. It is available for $650 from Amazon, although since it is a brand-new product it is listed as being on back order for a few weeks. So you’re definitely paying a premium price, but you get a fully-ruggedized unit and a rock-solid mount. If you’re planning on using it for any type of serious off-roading, those features alone – and the large 7-inch screen -- are worth a lot. If you want to get a sense of the TRX experience before you commit to the TRX7, you can register for an account at mytrxjournal.com and use the Web interface and free TRX mobile app to record and share trip information.